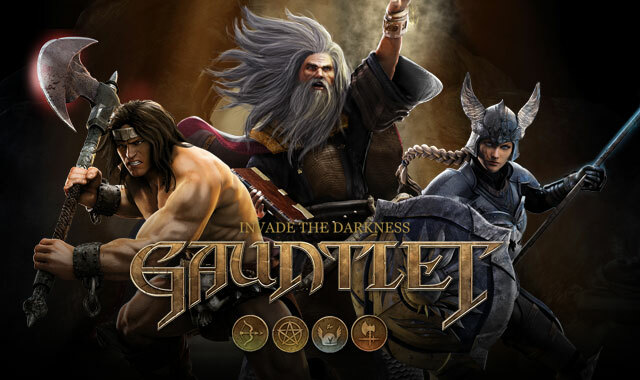 Warner Bros. Interactive Entertainment today released Gauntlet, a fully modernized reboot of the celebrated dungeon crawler, on Steam for PC, offering full support for SteamOS and the upcoming Steam Machines shipping next year. Developed by Arrowhead Game Studios, the game is available for an M.S.R.P. of £14.99. Players select from four classic fantasy-based characters: Warrior, Wizard, Valkyrie, or Elf. Each character has its own distinctive play style and unique strengths and weaknesses. Upon selecting a playable character, the gameplay is set within dungeons where the object is to fight through the chambers slaying evil creatures and completing challenges. An assortment of special items can be located in each dungeon that can restore the player’s health, unlock doors, and shift the odds in the player’s favor with magical relics which can aid the player in surviving longer in the Gauntlet. The enemies are a vast assortment of fantasy-based monsters, including ghosts, grunts, demons, spiders, sorcerers and skeleton warriors. Players can improve their heroes’ abilities and powers by unlocking achievements called “perks.” Multiple difficulty settings add to the game’s replayability. Gauntlet consists of environments like dusty crypts, dark caves, and fiery dungeons, each with varying styles of gameplay. Some dungeon maps allow players to explore and fight their way through chambers slaying evil creatures, completing challenges and discovering hidden secrets and gold. In other levels, Death itself chases players through an unpredictable labyrinth. There are also endurance maps where players must defeat waves of monsters to survive. Gauntlet is rated PEGI 16 for Violence, Blood and Gore, with a setting to disable the game’s gore. Nexon has announced that after years of service, Atlantica Online will be transferring to a new publisher: VALOFE.